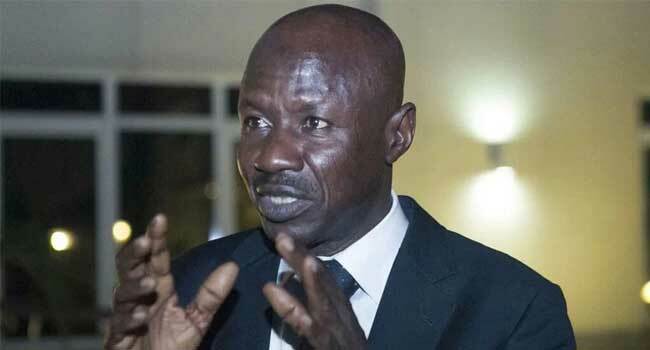 The Chairman Of Economic and Financial Crimes Commission (EFCC), Ibrahim Magu in a phone-in interview on Channels Television, during the Breakfast programme, Sunrise Daily, spoke about the numerous activities of the commission and current effort to arrest the embattled former Chairman of the defunct Presidential Task Force on Pension Reforms, Mr Abdulrasheed Maina. Q: What can you tell us about this ongoing Maina’s case. There are so many people who are surprised and they are looking on to the EFCC to swing into action perhaps much more than you have. What’s going on at the moment? A: This was something that we have done as far back as 2011. The matter has been in court, and Maina was also charged before the court. Infact, he was arraigned in absentia. So they should not go ahead in sweeping accusation as if the EFCC is involved, we are not involved. We are determined to get to the root of this matter. I am not satisfied with the investigation conducted so far. That’s why we have renewed the investigation. We will retrieve all properties or whatever must have been stolen from public funds and we will get back to you very soonest. Q: You determination to pursue this case is good news, but then, does that mean you will start the investigation afresh? A: Not afresh, but there are real grey areas that need to be tacked properly. All those loopholes and gaps, we will follow it up and make sure all the people who are involved will face the full wrath of the law. Q: Let’s look at the grey areas that are giving some Nigerians concern. Some are concerned that it took all these years for the EFCC to seal up buildings that allegedly belong to Maina. Why did it take so long? A: When I came in, the matter was already in court so I was so busy pursuing other issues. You need to be there to see the bulk of work we have in hand. A: The SAN has a right to his opinion so I wouldn’t want to join issue with him. Q: If the EFCC is actually underfunded, then this case of Maina would also go the way of other cases. A: No, Underfunding is not an issue. The determination of us in the EFCC is to come fully into the fight against corruption. In this regards, the media should join us. Because they have the very important role of sensitising and educating Nigerians that corruption is evil and wrong because some people don’t even believe that corruption is wrong. Q: How is it that this man who has been on your wanted list come into the country. Did you try to arrest him before he was reinstated? What happened? “I really don’t know what happened. But I know that he has been properly placed on the watch list and he cannot sneak into this country without the law enforcement agencies. So something is wrong somewhere. Actually, we need to look at that. It is just terrible. Q: The same way some say Maina sneaked into the country, some say it is also possible that he may have sneaked out. Are you working with INTERPOL to get him arrested and brought back into the country? “He has already been declared wanted by the INTERPOL. He is a wanted person, and we are going to visit several other countries ad request for assistance, particularly Dubai, USA and UK. We are already on the manhunt, seriously. Q: Considering the fact that you were in the EFCC when this whole issue started, would you still continue this fight to a conclusive end? A: When the investigation was conducted, I repeat that I was not in the EFCC, as that the time the investigation was conducted. But we will go after everybody involved in this case. The media and other Nigerians can help us with information to get Maina arrested. Q: Does that you seem to suggest that you don’t know where Maina is right now? Of course. If I know, why should I be telling you and Nigerians to give us information to help in his arrest? But wherever he is, I assure you, we will get him sooner or later. Q: When you are asking from the media and other agencies, one other major support that you need is the Senate, how well has your relationship being able to advance? A: The national assembly is supporting us and we are collaborating. We are giving them support and they are also supporting us.